Leeds strolled into the second round of the Carling Cup with a thumping victory at home against Lincoln City. The hosts took an early lead when Jonathan Howson nodded in Sanchez Watt's cross, before Luciano Becchio converted Lloyd Sam's left-wing ball. Joe Anyon saved well from Watt but it was 3-0 when Sam headed home Paul Connolly's dink to the far post. Leeds cruised after the break and when Paul Green brought down Watt, Neil Kilkenny wrapped it up from the spot. "We said to the players before the game that we can't underestimate Lincoln and we had to show a really good attitude and we did that. "We worked hard and played some very good stuff. We were creative when we needed to be and got the early goals that settled us and give us a lift. "The key was that we didn't relax and we kept pushing after those goals. "We kept a clean sheet too so there were many good things to come from this game and it;s pleasing to see." "Being realistic, it was always going to be difficult playing a team from two leagues up but having said that we have to start better. "It was a poor first goal to give away and against a side who are comfortable on the ball but also have a physical presence it was always going to be tough. "I think it was a tall order to win, but we would have liked to have stayed in the game a little bit longer." 93:37 The game gets underway. 90:00+3:01 Shot by Aidan White (Leeds) right-footed from right side of penalty area (20 yards), missed left. 90:00+2:21 Inswinging corner from right by-line taken left-footed by Albert Jarrett (Lincoln City) to near post, clearance by Lloyd Sam (Leeds). 90:00+1:54 Attacking throw-in by Paul Green (Lincoln City). 90:00+1:40 Goal kick taken long by Joe Anyon (Lincoln City). 90:00+1:28 Cross by Paul Connolly (Leeds), resulting in ball out of play. 90:00+0:29 Attacking throw-in by Aidan White (Leeds). 89:51 Andrew Hutchinson (Lincoln City) caught offside. Direct free kick taken right-footed by Kasper Schmeichel (Leeds) from own half, resulting in open play. 88:44 Foul by Alex Bruce (Leeds) on Delroy Facey (Lincoln City). Direct free kick taken left-footed by Cian Hughton (Lincoln City) from left channel, passed. 87:55 Foul by Sanchez Watt (Leeds) on Adam Watts (Lincoln City). Direct free kick taken right-footed by Moses Swaibu (Lincoln City) from own half, passed. 87:41 Goal kick taken long by Joe Anyon (Lincoln City). 86:04 Foul by Moses Swaibu (Lincoln City) on Sanchez Watt (Leeds). Direct free kick taken right-footed by Andy Hughes (Leeds) from right channel, shot by Lloyd Sam (Leeds) right-footed from centre of penalty area (18 yards), over the bar. 85:45 Cross by Lloyd Sam (Leeds), clearance by Moses Swaibu (Lincoln City). 84:50 Attacking throw-in by Federico Bessone (Leeds). 84:09 Corner from left by-line taken short right-footed by Neil Kilkenny (Leeds). Cross by Federico Bessone (Leeds), clearance by Adam Watts (Lincoln City). 83:33 Defending throw-in by Paul Connolly (Leeds). 82:42 Cross by Paul Connolly (Leeds), clearance by Adam Watts (Lincoln City). 81:08 Handball by Jamie Clapham (Lincoln City). Free kick crossed right-footed by Neil Kilkenny (Leeds) from right wing, clearance by Josh O'Keefe (Lincoln City). 80:06 Cross by Delroy Facey (Lincoln City), save (caught) by Kasper Schmeichel (Leeds). 79:34 Defending throw-in by Paul Green (Lincoln City). 79:16 Attacking throw-in by Paul Connolly (Leeds). 78:42 Foul by Adam Watts (Lincoln City) on Mike Grella (Leeds). Direct free kick taken right-footed by Mike Grella (Leeds) from right channel, resulting in open play. 77:55 Foul by Sanchez Watt (Leeds) on Josh O'Keefe (Lincoln City). Direct free kick taken left-footed by Jamie Clapham (Lincoln City) from own half, resulting in open play. 77:00 Goal kick taken long by Kasper Schmeichel (Leeds). 76:41 Defending throw-in by Kasper Schmeichel (Leeds). 76:03 Attacking throw-in by Paul Green (Lincoln City). 75:59 Goal kick taken long by Kasper Schmeichel (Leeds). 75:51 Shot by Delroy Facey (Lincoln City) drilled right-footed from left channel (20 yards), over the bar. 75:01 Inswinging corner from right by-line taken left-footed by Andrew Hutchinson (Lincoln City) to centre, save (punched) by Kasper Schmeichel (Leeds). 74:47 Cross by Mustapha Carayol (Lincoln City), clearance by Federico Bessone (Leeds). 74:14 Foul by Federico Bessone (Leeds) on Albert Jarrett (Lincoln City). Direct free kick taken right-footed by Paul Green (Lincoln City) from right channel, passed. 73:34 Goal kick taken long by Joe Anyon (Lincoln City). 73:26 Cross by Aidan White (Leeds), resulting in ball out of play. 72:38 Attacking throw-in by Paul Green (Lincoln City). 72:28 Attacking throw-in by Paul Green (Lincoln City). 72:22 Attacking throw-in by Joe Anyon (Lincoln City). 71:19 Substitution Leeds substitution: Jonathan Howson replaced by Andy Hughes (tactical). 71:19 Substitution Lincoln City substitution: Scott Kerr replaced by Andrew Hutchinson (tactical). 69:53 GOAL - Neil Kilkenny:Leeds United 4 - 0 Lincoln City Placed penalty taken right-footed by Neil Kilkenny (Leeds) (bottom-right of goal), scored.Leeds 4-0 Lincoln City. 69:53 Foul by Paul Green (Lincoln City) on Lloyd Sam (Leeds). 68:59 Inswinging corner from left by-line taken right-footed by Neil Kilkenny (Leeds) to near post, resulting in open play. 68:48 Cross by Paul Green (Lincoln City), save (caught) by Kasper Schmeichel (Leeds). 68:33 Cross by Albert Jarrett (Lincoln City), clearance by Neill Collins (Leeds). 67:24 Defending throw-in by Paul Green (Lincoln City). 66:22 Foul by Albert Jarrett (Lincoln City) on Federico Bessone (Leeds). Direct free kick taken right-footed by Kasper Schmeichel (Leeds) from own half, resulting in open play. 64:25 Goal kick taken long by Joe Anyon (Lincoln City). 63:54 Cross by Paul Connolly (Leeds), clearance by Adam Watts (Lincoln City). 63:26 Attacking throw-in by Federico Bessone (Leeds). 62:27 Cross by Mustapha Carayol (Lincoln City), save (caught) by Kasper Schmeichel (Leeds). 62:04 Cross by Aidan White (Leeds), clearance by Adam Watts (Lincoln City). 61:43 Defending throw-in by Paul Green (Lincoln City). 61:33 Goal kick taken long by Kasper Schmeichel (Leeds). 60:31 Substitution Lincoln City substitution: Gavin McCallum replaced by Delroy Facey (tactical). 60:31 Substitution Leeds substitution: Luciano Becchio replaced by Mike Grella (tactical). 60:31 Substitution Leeds substitution: Bradley Johnson replaced by Aidan White (tactical). 60:03 Shot by Mustapha Carayol (Lincoln City) right-footed from left channel (25 yards), over the bar. 59:04 Handball by Jamie Clapham (Lincoln City). Free kick crossed left-footed by Sanchez Watt (Leeds) from right wing, save (punched) by Joe Anyon (Lincoln City). 55:41 Foul by Scott Kerr (Lincoln City) on Neil Kilkenny (Leeds). Direct free kick taken right-footed by Neil Kilkenny (Leeds) from own half, resulting in open play. 55:06 Mustapha Carayol (Lincoln City) caught offside. Indirect free kick taken right-footed by Kasper Schmeichel (Leeds) from own half, resulting in open play. 54:49 Cross by Paul Green (Lincoln City), resulting in open play. 54:11 Defending throw-in by Jamie Clapham (Lincoln City). 54:00 Attacking throw-in by Paul Connolly (Leeds). 53:39 Foul by Scott Kerr (Lincoln City) on Lloyd Sam (Leeds). Direct free kick taken right-footed by Lloyd Sam (Leeds) from left channel, passed. 52:47 Foul by Neill Collins (Leeds) on Gavin McCallum (Lincoln City). Direct free kick taken right-footed by Cian Hughton (Lincoln City) from right channel, passed. 52:41 Defending throw-in by Paul Green (Lincoln City). 51:53 Defending throw-in by Paul Connolly (Leeds). 51:14 Foul by Scott Kerr (Lincoln City) on Bradley Johnson (Leeds). Direct free kick taken right-footed by Neil Kilkenny (Leeds) from right channel, passed. 50:50 Defending throw-in by Jamie Clapham (Lincoln City). 50:19 Attacking throw-in by Federico Bessone (Leeds). 50:05 Cross by Federico Bessone (Leeds), clearance by Adam Watts (Lincoln City). 49:46 Goal kick taken short by Joe Anyon (Lincoln City). 49:14 Shot by Bradley Johnson (Leeds) drilled left-footed from right channel (25 yards), missed left. 48:15 Cross by Paul Connolly (Leeds), save (caught) by Joe Anyon (Lincoln City). 47:35 Foul by Neill Collins (Leeds) on Josh O'Keefe (Lincoln City). Direct free kick taken left-footed by Albert Jarrett (Lincoln City) from right channel, passed. 47:04 Goal kick taken long by Joe Anyon (Lincoln City). 46:56 Defending throw-in by Paul Green (Lincoln City). 45:54 Defending throw-in by Paul Green (Lincoln City). 45:01 Substitution Lincoln City substitution: Joe Anderson replaced by Jamie Clapham (tactical). 45:00+2:02 Attacking throw-in by Paul Green (Lincoln City). 45:00+1:47 Shot by Gavin McCallum (Lincoln City) drilled left-footed from right channel (20 yards), blocked by Neill Collins (Leeds). 45:00+1:12 Foul by Luciano Becchio (Leeds) on Adam Watts (Lincoln City). Direct free kick taken right-footed by Adam Watts (Lincoln City) from own half, resulting in open play. 44:47 Attacking throw-in by Paul Connolly (Leeds). 43:52 Goal kick taken long by Kasper Schmeichel (Leeds). 43:23 Outswinging corner from left by-line taken left-footed by Albert Jarrett (Lincoln City) to out of play, resulting in ball out of play. 43:06 Goal kick taken short by Joe Anyon (Lincoln City). 42:55 Shot by Neil Kilkenny (Leeds) volleyed right-footed from right channel (20 yards), over the bar. 42:47 Cross by Paul Connolly (Leeds), clearance by Paul Green (Lincoln City). 41:17 Goal kick taken long by Joe Anyon (Lincoln City). 41:09 Cross by Lloyd Sam (Leeds), resulting in ball out of play. 40:28 Cross by Neil Kilkenny (Leeds), save (punched) by Joe Anyon (Lincoln City). 39:27 Goal kick taken long by Kasper Schmeichel (Leeds). 39:06 Shot by Mustapha Carayol (Lincoln City) drilled right-footed from left channel (20 yards), missed right. 38:53 Cross by Albert Jarrett (Lincoln City), clearance by Neill Collins (Leeds). 38:21 Attacking throw-in by Joe Anderson (Lincoln City). 37:22 Defending throw-in by Paul Green (Lincoln City). 37:01 Goal kick taken long by Kasper Schmeichel (Leeds). 34:57 Cross by Scott Kerr (Lincoln City), clearance by Neill Collins (Leeds). 34:51 Attacking throw-in by Albert Jarrett (Lincoln City). 34:30 Inswinging corner from right by-line taken left-footed by Albert Jarrett (Lincoln City) to near post, clearance by Luciano Becchio (Leeds). 34:19 Shot by Mustapha Carayol (Lincoln City) drilled right-footed from right channel (25 yards), blocked by Neill Collins (Leeds). 34:01 Goal kick taken long by Joe Anyon (Lincoln City). 33:54 Cross by Alex Bruce (Leeds), resulting in ball out of play. 33:49 Cross by Neil Kilkenny (Leeds), clearance by Adam Watts (Lincoln City). 33:35 Corner from left by-line taken short right-footed by Neil Kilkenny (Leeds). 33:07 Shot by Bradley Johnson (Leeds) curled left-footed from right channel (20 yards), save (tipped round post) by Joe Anyon (Lincoln City). 32:30 Defending throw-in by Joe Anderson (Lincoln City). 31:19 Goal kick taken long by Kasper Schmeichel (Leeds). 31:12 Cross by Albert Jarrett (Lincoln City), resulting in ball out of play. 30:29 Goal kick taken long by Kasper Schmeichel (Leeds). 30:15 Attacking throw-in by Joe Anderson (Lincoln City). 29:35 Assist (cross) by Paul Connolly (Leeds) from right wing. 29:35 GOAL - Lloyd Sam:Leeds United 3 - 0 Lincoln City headed goal by Lloyd Sam (Leeds) (bottom-right of goal) from centre of penalty area (12 yards).Leeds 3-0 Lincoln City. 28:48 Inswinging corner from left by-line taken right-footed by Neil Kilkenny (Leeds) to centre, save (punched) by Joe Anyon (Lincoln City). Correction - 28:29 Shot by Bradley Johnson (Leeds) drilled left-footed from left channel (25 yards), blocked by Adam Watts (Lincoln City). 28:29 Shot by Bradley Johnson (Leeds) drilled left-footed from left channel (25 yards), blocked by Scott Kerr (Lincoln City). 28:09 Cross by Federico Bessone (Leeds), clearance by Adam Watts (Lincoln City). 27:04 Goal kick taken long by Joe Anyon (Lincoln City). 26:43 Shot by Jonathan Howson (Leeds) drilled right-footed from right channel (18 yards), missed right. 25:46 Defending throw-in by Paul Green (Lincoln City). 24:46 Shot by Bradley Johnson (Leeds) drilled left-footed from left channel (25 yards), blocked by Paul Green (Lincoln City). 24:11 Goal kick taken long by Joe Anyon (Lincoln City). 23:52 Shot by Bradley Johnson (Leeds) drilled left-footed from left channel (35 yards), over the bar. 23:18 Cross by Gavin McCallum (Lincoln City), save (caught) by Kasper Schmeichel (Leeds). 22:27 Foul by Alex Bruce (Leeds) on Mustapha Carayol (Lincoln City). Free kick crossed right-footed by Mustapha Carayol (Lincoln City) from left wing, clearance by Neil Kilkenny (Leeds). 21:52 Attacking throw-in by Paul Green (Lincoln City). 20:48 Foul by Sanchez Watt (Leeds) on Adam Watts (Lincoln City). Direct free kick taken right-footed by Joe Anyon (Lincoln City) from own half, resulting in open play. 20:39 Cross by Bradley Johnson (Leeds), clearance by Cian Hughton (Lincoln City). 20:33 Cross by Jonathan Howson (Leeds), clearance by Adam Watts (Lincoln City). 20:10 Outswinging corner from right by-line taken right-footed by Neil Kilkenny (Leeds) to near post, clearance by Paul Green (Lincoln City). 19:51 Shot by Sanchez Watt (Leeds) drilled left-footed from right channel (20 yards), save (tipped over) by Joe Anyon (Lincoln City). 19:06 Foul by Alex Bruce (Leeds) on Josh O'Keefe (Lincoln City). Direct free kick taken right-footed by Albert Jarrett (Lincoln City) from right channel, passed. 18:51 Goal kick taken long by Joe Anyon (Lincoln City). 18:24 Shot by Sanchez Watt (Leeds) left-footed from centre of penalty area (12 yards), save (parried) by Joe Anyon (Lincoln City). 16:11 Defending throw-in by Federico Bessone (Leeds). 15:49 Defending throw-in by Joe Anderson (Lincoln City). 15:14 Goal kick taken long by Joe Anyon (Lincoln City). 14:27 Defending throw-in by Joe Anderson (Lincoln City). 13:54 Defending throw-in by Paul Green (Lincoln City). 13:32 Foul by Bradley Johnson (Leeds) on Paul Green (Lincoln City). Direct free kick taken right-footed by Joe Anyon (Lincoln City) from own half, passed. 12:51 Foul by Paul Connolly (Leeds) on Mustapha Carayol (Lincoln City). Direct free kick taken left-footed by Paul Green (Lincoln City) from left wing, passed. 11:50 Cross by Albert Jarrett (Lincoln City), resulting in open play. 11:26 Attacking throw-in by Paul Connolly (Leeds). 10:47 Defending throw-in by Paul Connolly (Leeds). 10:08 Foul by Bradley Johnson (Leeds) on Josh O'Keefe (Lincoln City). Direct free kick taken right-footed by Adam Watts (Lincoln City) from right channel, passed. 9:31 Foul by Federico Bessone (Leeds) on Albert Jarrett (Lincoln City). Direct free kick taken right-footed by Joe Anyon (Lincoln City) from own half, resulting in open play. 8:26 Attacking throw-in by Paul Connolly (Leeds). 8:01 Gavin McCallum (Lincoln City) caught offside. Indirect free kick taken right-footed by Kasper Schmeichel (Leeds) from own half, resulting in open play. 6:52 Assist (pass) by Sanchez Watt (Leeds) from left side of penalty area. 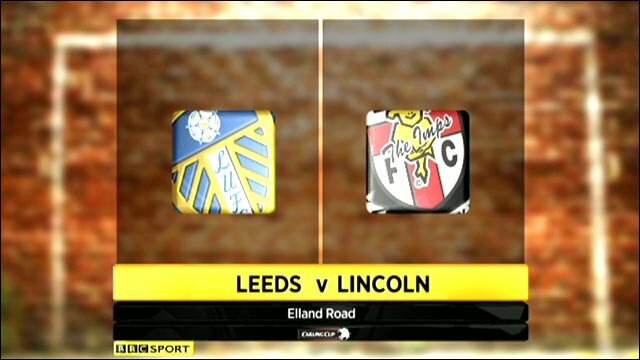 6:52 GOAL - Luciano Becchio:Leeds United 2 - 0 Lincoln City Goal by Luciano Becchio (Leeds) volleyed left-footed (bottom-right of goal) from centre of penalty area (6 yards).Leeds 2-0 Lincoln City. 6:13 Goal kick taken long by Joe Anyon (Lincoln City). 6:03 Cross by Lloyd Sam (Leeds), resulting in ball out of play. 5:38 Corner from right by-line taken short left-footed by Lloyd Sam (Leeds). 5:32 Cross by Lloyd Sam (Leeds), clearance by Moses Swaibu (Lincoln City). 5:13 Attacking throw-in by Paul Connolly (Leeds). 4:11 Goal kick taken long by Kasper Schmeichel (Leeds). 3:44 Defending throw-in by Joe Anderson (Lincoln City). 3:15 Foul by Paul Green (Lincoln City) on Sanchez Watt (Leeds). Direct free kick taken right-footed by Neil Kilkenny (Leeds) from left channel, passed. 2:39 Luciano Becchio (Leeds) caught offside. Indirect free kick taken right-footed by Joe Anyon (Lincoln City) from own half, resulting in open play. 2:19 Shot by Mustapha Carayol (Lincoln City) drilled right-footed from left side of penalty area (12 yards), save (caught) by Kasper Schmeichel (Leeds). 1:13 Assist (cross) by Sanchez Watt (Leeds) from left side of penalty area. 1:13 GOAL - Jonathan Howson:Leeds United 1 - 0 Lincoln City Headed goal by Jonathan Howson (Leeds) (low centre of goal) from right side of six-yard box (6 yards).Leeds 1-0 Lincoln City. 0:38 Attacking throw-in by Paul Connolly (Leeds). 0:05 Defending throw-in by Paul Connolly (Leeds). The referee blows his whistle to end the game.